Whether you pick them off your own tree or buy them, fresh cherries are a prized summer treat. There are many cherry varieties classified into two categories: sweet and tart cherries. Tart cherries or pie cherries are grown in the northern United States. Sweet cherries, including Bing cherries, are grown in more temperate climates. Farmer’s markets will have fresh cherries from your region while stores sell sweet cherries. No matter what your preference, cherries are rich in several important nutrients. Cherries are 80 percent water. According to the U.S. Department of Agriculture, a pound of sweet cherries is about 3 cups of cherries or 90 sweet cherries. A pound of sweet cherries has 286 calories and a pound of tart cherries has 227 calories. The calorie difference comes from the sugars. As the names imply, sweet cherries have more sugars per pound, 30 grams of glucose and 24 grams of fructose, compared to tart cherries, which have 19 grams of glucose and 16 grams of fructose. The USDA estimates a pound of sweet cherries has 9.5 grams or 38 percent of the 25 grams of fiber recommended daily for women under the age of 50. It's 45 percent of the 21 grams of fiber women over the age of 50 need each day. Tart cherries have 7.3 grams of fiber per pound. The Harvard School of Public Health states that a high-fiber diet lowers your risk of heart disease, diabetes and constipation. Cherries are a good source of potassium, an essential electrolyte. 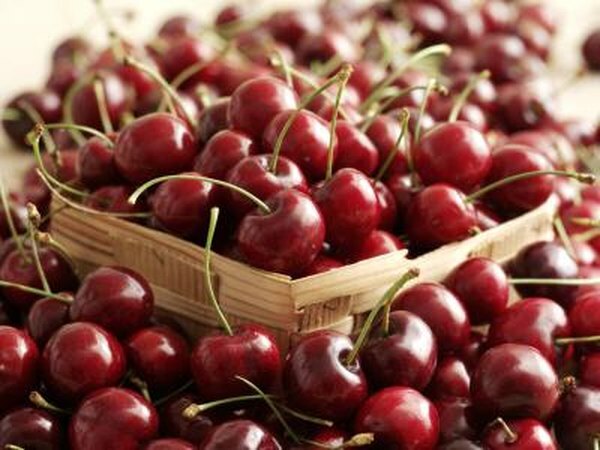 The USDA lists 3 cups of cherries as providing about 23 percent of the RDA of potassium or 1,067 milligrams potassium. The Oregon State University Linus Pauling Institute notes normal function of your body depends on potassium. A deficit results in weakness, fatigue, abdominal cramps, and severe low levels of potassium can cause abnormal heart rhythms. Maintaining a balance of sodium and potassium helps prevent stroke, hypertension, osteoporosis and kidney stones. A good amount of the 75 milligrams of vitamin C you need each day is yours for eating a pound of cherries. Sweet cherries have 32 milligrams of vitamin C and tart cherries have 45 milligrams. Collagen formation, neurotransmission, cholesterol metabolism and energy metabolism require vitamin C. Cardiovascular health is improved and stroke risk is decreased by higher intakes of vitamin C from diet, according to the Linus Pauling Institute. Anthocyanins are antioxidants giving cherries their red color. Eating a pound of tart cherries was shown to raise blood levels of antioxidants in a 2009 study conducted by Dr. Sara Warber of University of Michigan Medical School. Her work also showed lower blood cholesterol and triglycerides in patients who ate a high cherry diet. Harvard School of Public Health notes taking antioxidants has not been shown to prevent disease, but antioxidant rich fruit consumed as part of a normal diet may play a preventive role in heart disease and cancer.